To create a balance between our motives and our goals, we must first learn to recognize the six hidden motives that weaken our ability to succeed. During counseling sessions, Dr. James R. Baugh discovered a correlation between the victimized feelings and behaviors of his clients and their maturity level. In his book, he shows how our internal needs direct our behaviors and motives, and how through maturity we can redirect our motives to achieve our goals. Photography began as a hobby for Julia Sims, but the tragic deaths of her mother, father, and brother led her to search for a means of healing from her grief. Sims eventually learned that the only time she was able to feel at peace from her loss was when she was in nature, camera in hand. Sims’ craft guided her through her recovery, and her beautiful pictorial artistry comes alive on every page. 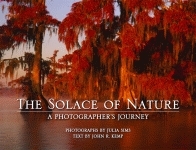 With amazing clarity, each image evokes in the reader a sense of Sims’ inner turmoil and the peace and harmony she found in the beauty of the natural world. When summer arrives for thirteen-year-old Tobey Freeman, he looks forward to long days of laser tag and adventures on the bayou. However, an unexpected invitation into the world of espionage interrupts his plans. Soon secrecy and suspense replace his carefree days, and he must make some difficult decisions in order to protect his friends and family. Each year, nearly half a million people flock to Savannah, Georgia, to partake in the city’s historic and grand St. Patrick’s Day festivities. Boasting the second-largest parade in the country after New York, Savannah hosts a legendary party where everything is green and everyone can be Irish for a day. Beginning where See You at the Top left off, Steps to the Top expands the message of that classic work on self-development. Focusing on seven keys to personal improvement, each with specific action steps for today, Steps to the Top can guide the goal-oriented reader to higher levels of success. Rather than analyze the underlying causes of the war, the author focuses on the men who endured it, the men of the Sumter Flying Artillery. Speicher’s scope includes Allen Sherrod Cutts, the battery’s first commander and most prominent member. This remarkable man received personal congratulations from Gen. Robert E. Lee for leading his battalion to safety during the deadly battle of South Mountain in 1862. Megani, a fifteen-year-old girl, uses her powers of the Pearl and Wizard Stone to help the people of Trinity keep the peace. Now, for the first time in her life, she must rely upon others to help her: a mysterious historian, a warrior archer, and a strange orphan girl named Lydni. Together they must defeat the Wizard, who has the power to rob people of their free will. In this sequel to Gene Del Vecchio’s acclaimed first young-adult novel, The Pearl of Anton, whoever finds and mends the Sword of Legends will rule. Think Pink by Olga Cossi is an imaginative story that introduces children to the concept of self-control. Through the misadventures of a semi-famous duck, they see the problems and consequences that come with acting impulsively and not considering the consequences of their actions. Robert Penn Warren, the first U.S. Poet Laureate, has received every honor this country can bestow on a writer. Warren has written fiction, nonfiction, and poetry, and has proven to be one of the most versatile writers in modern times. Now, seven original essays on Warren’s writing, written by leading scholars and students, have been brought together in one volume. Hardcover. Help one another. Say you’re sorry. Toby remembers what her rabbi said in his sermon for Rosh Hashanah, and she plans on being a good citizen, giving charity, apologizing for anything that might have hurt someone, and helping others. After saying “sorry” to her best friend Donna, Toby helps her understand all of the customs involved with the Jewish New Year. Hardcover. Welcome to the Belfer house, the only Jewish home in a small South Louisiana town. The celebration of Passover is coming and Toby Belfer’s best friend, Donna, is coming over to share in the festivities of the Seder supper. Donna does not know much about the celebration of the Seder because at her church they celebrate Easter. During one magical night she will experience the traditions and learn the history of the Jewish feast of deliverance. Hardcover. It is quite a common assumption that Irish culinary talents extend no further than the preparation of potatoes and the brewing of strong whiskey. This belief, however, is erroneous, as the rich and diverse offerings in Traditional Irish Recipes demonstrate. A week in the life of a lonely, nameless miner proves to be filled with nothing but heartache. Throughout the week, a friendly pack rat scurries about collecting his loot and watching his human neighbor. As the miner copes with his incredible hunger, robbers take what few valuables he has left. He does not surrender to despair, however. Hardcover. Turkish cuisine has borrowed from French, Italian, Persian, Ottoman, and Arab influences to craft menus rich in culture and tradition. With more than 650 recipes broken down into twenty-four categories, The Turkish Dining Table: Recipes for Health and Happiness is a valuable cookbook for the novice or expert who is interested in experiencing great Turkish cuisine. From hummus to grilled whiting, from lentil and mint soup to Bosnian ravioli, all food categories are covered in this complete Turkish cookbook. Entire meals to snacks and desserts are offered, some very familiar to American palates, others a distinct departure from the ordinary. In 1951 a hardened young army lieutenant must balance his belief in the United Nations’ mission with his contempt for the seemingly futile methods used to achieve it. Lt. John Winston finally resolves this conflict, and the repercussions will haunt him forever. This beautifully illustrated board book tells the whimsical story of how a little leprechaun protects the secret of his pot o’ gold. 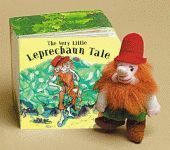 Saving the best for last, literally, the book houses a plush leprechaun toy that may be removed after turning the final page. Boardbook.